Remember to wear something green, or you could get /Pinched! 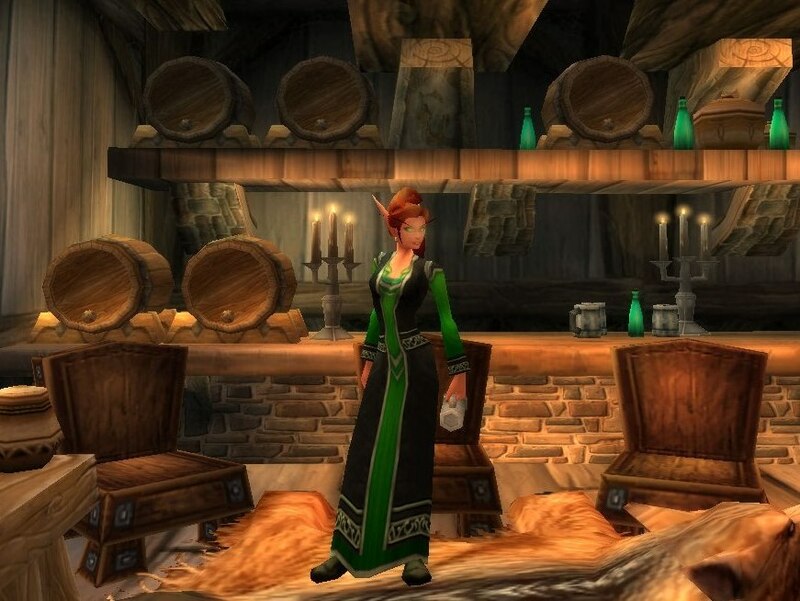 The vendor bought Heavy Weave Set is a quick way for instant St. Paddy’s Day wear. It’s bright green and teal shades are perfect to mix and match into other outfits, should wearing the whole set not be quite your style. 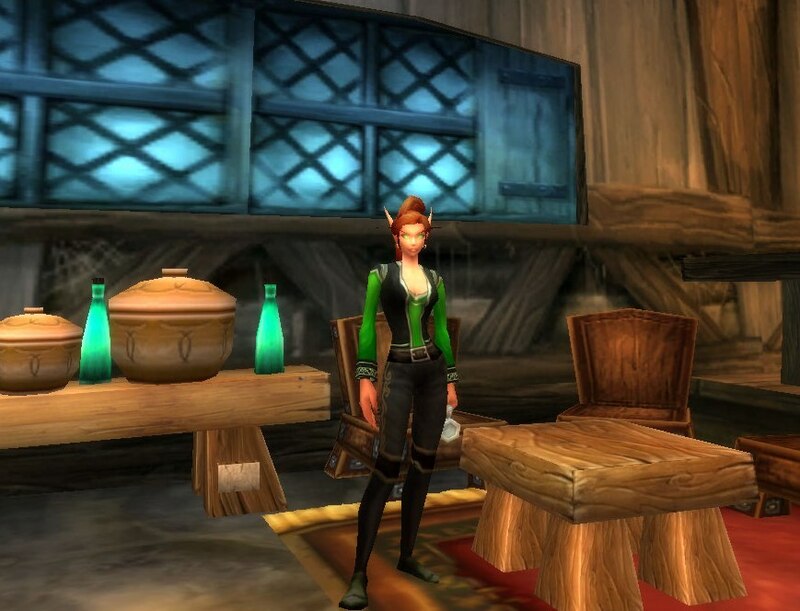 Another quick outfit is wearing a green shirt with a no-level requirement pants, like the pictured Haliscan Pantaloons, or Tuxedo Pants. This is a great type of outfit for low-level bank-alts who still would like to dress accordingly. The belt and/or other accessories you can add to this outfit can be scaled down to meet a low level requirements. The Heavy Weave Shoes still make a great pairing with the fancy Haliscan Pantaloons, their dark green color complimenting whatever green shirt your character wears. I had these pieces already for Kirina, and, will probably be running around in this silly get-up later this St. Patrick’s Day evening. The Conjurer’s Bracers gives the nice darker green cuffs to the shirt; however, the vest looks fine without them, as well. 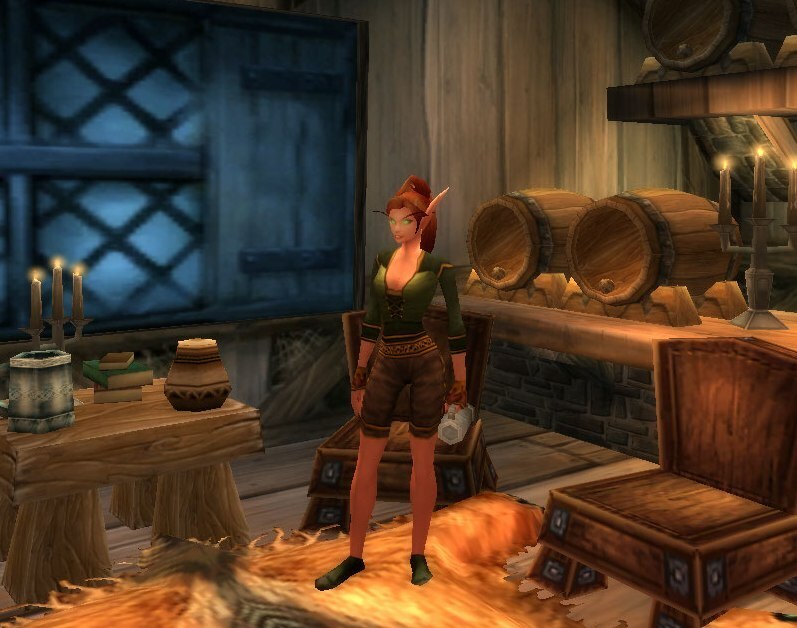 This outfit kind of reminds me of a Brewfest outfit I made, and, incidentally, the Green Brewfest Hat is a great accessory to have for this occasion. 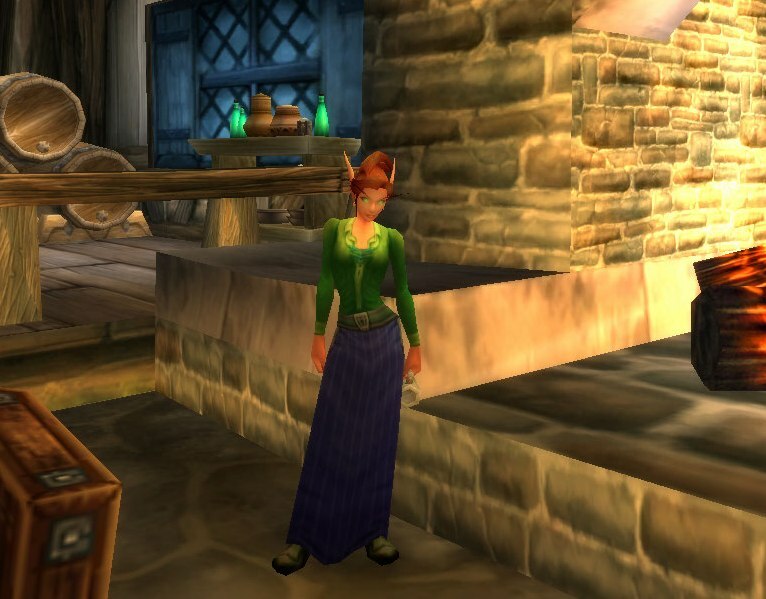 This robe is a common drop drop off of the rare mob, Nefaru, out in Duskwood. It was pretty easy for me to farm when I did so a while ago, and is very versatile in any theme of outfits. Lastly, a Simple Kilt outfit! All of these outfits used the Ornate Drinking Stein as an off-hand frill, but any festive mug or accessory will work just fine. Happy St. Patrick’s Day! Oh? You didn’t know it was Ninja’s Day as well as Pirate’s Day on September 19? Exactly! That’s just how sneaky we ninja’s are – “ninja adding” a make-believe holiday to one already in existence. 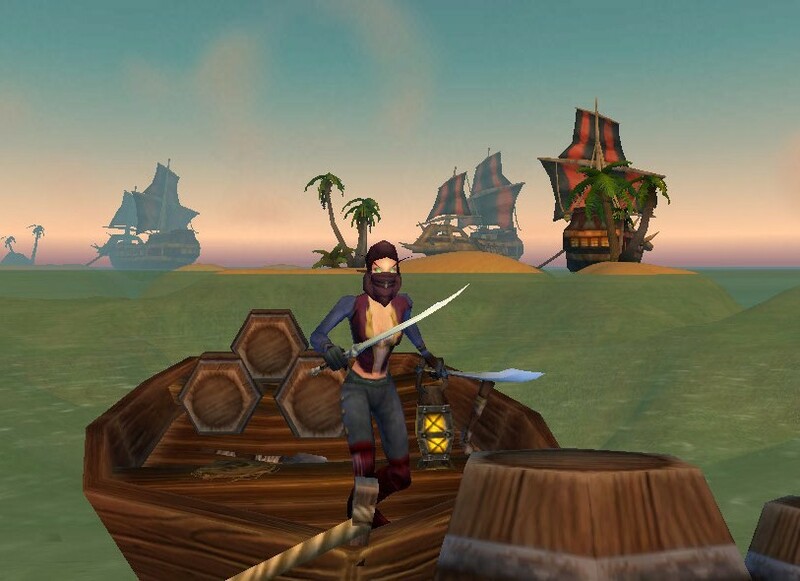 So, for all those, like us, who simply can not get over the fact that pirate’s may have just beaten us in the popularity contest, wear your best ninja outfit this Pirate’s…I mean, Niiinnjjaaa’s…Day….to show your obstinate loyalty. This first outfit is a more traditional ninja outfit, with many substitutions for each piece of gear. The uncommon world drop leg armor, Master’s Leggings, could be replaced for any other black pants, especially for pants like the Tuxedo Pants (crafted) or the Black Tuxedo Pants (Noblegarden garb with no level requirement), to stay simple (and cheap ^_^). Much like the pants, the Scouting Boots can be replaced with any other more easily obtainable black boots/shoes, or simply with the Dress Shoes – which also have no level requirement. 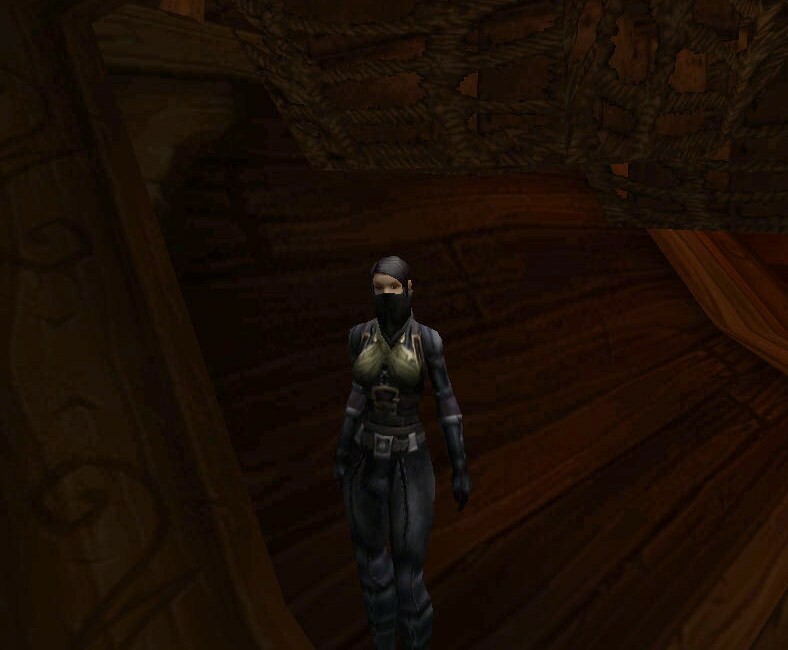 The Tattered Cloth Vest and the Tattered Cloth Belt are vendor bought armor and are nice, cheap additions in a ninja outfit. The Black Mageweave Shoulders are a good alternative for the Silver-thread Amice, should anyone wish to add shoulder armor to their ninja outfit. Likewise, the Black Mageweave Gloves could be replaced with the Tattered Cloth Gloves to match with the outfit even more. 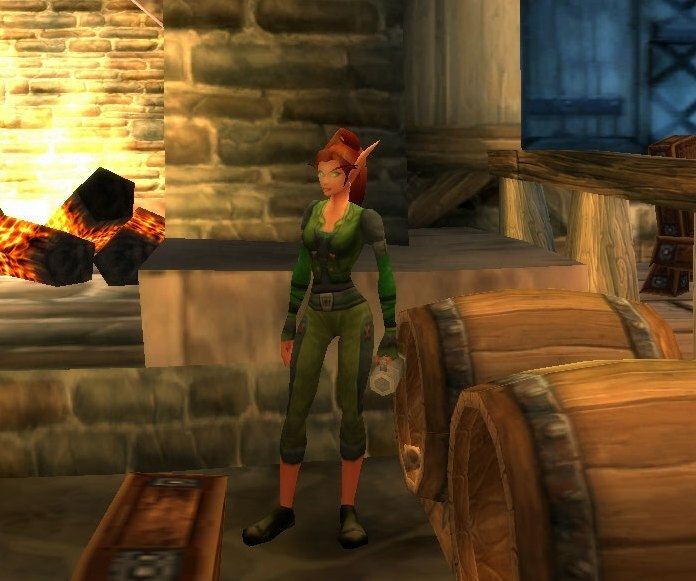 The Bandit Boots can be replaced with its lower level, and common, version – the Recruit’s Boots – which are Human/Gnome/Dwarf Warrior starter boots, and can be bought from Thomas Yance. 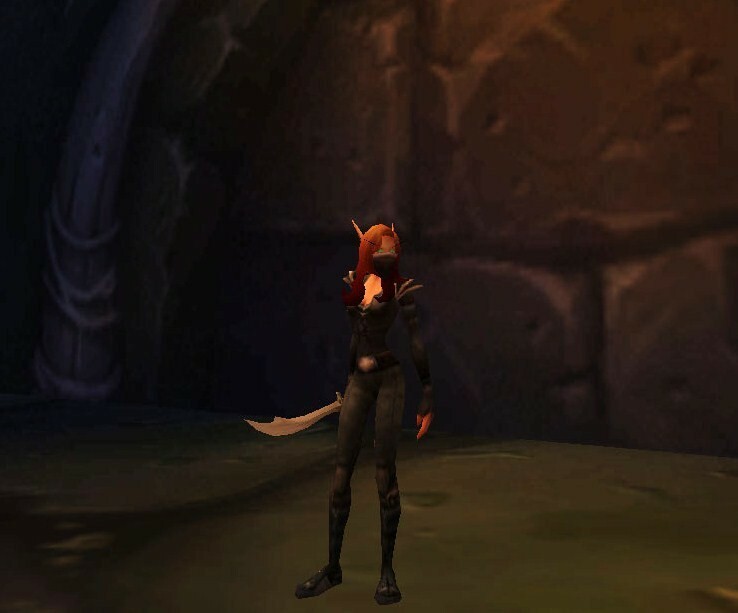 Instead of the Blackened Defias Gloves, one could always wear the Black Mageweave Gloves; they are shorter, but, still match with the outfit. The Hanzo Sword is a rare world drop, but, a great “samuri-like” sword to have for RP purposes. It is also used in another outfit found in my Top of the Class: Rogue Outfits article, where I list several alternate swords with the same style as it. Guy characters could wear this same Black Mageweave armor based outfit, but, it would look completely different. These next couple of outfits are for those ninjas who secretly want to be a pirate, as they are brighter in color, and look more like a scurvy swashbuckler than a stealthy ninja. The Starfire Vest is a very nice chest-piece, but, it is a low world drop in the Outlands. The Dementia Hood is also an Outland world drop; however, with both equipped – they match perfectly to one another. 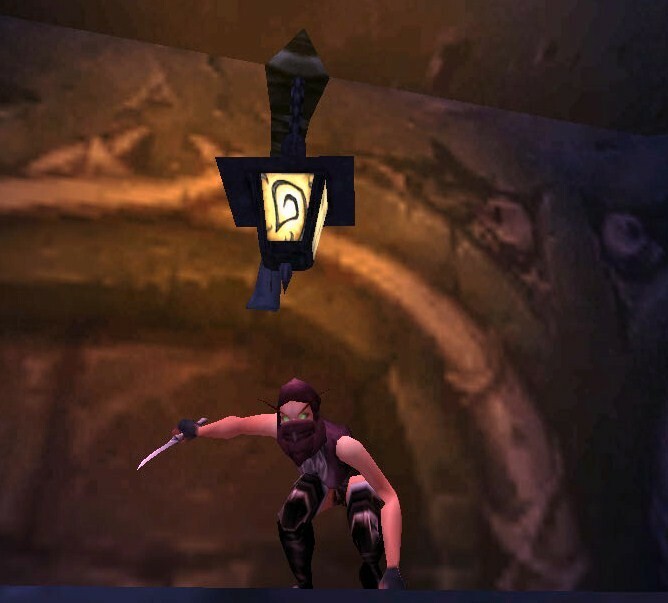 The Apothecary Gloves, were a reward from a Horde quest, but any other form-fitting black gloves will do, if desired to add in your ninja outfit. The Bard’s Boots are the reddish/purple version of the Bandit Boots, and match the hood and the chest. The swords Light Scimitar and Ebon Scimitar can be substituted for any other sword/dagger to fit ones armor availability. For mid-level players, you can by the Falchion sword, sold by many vendors, in replacement of the Ebon Scimitar; they have the same model. This outfit is a little bit more rugged than the previous ninja-pirate one. The Ruffian Belt, the Bandit Boots, and the Metalworking Gloves all compliment one another with the large buckles found on all of them. This same outfit can be done with using the White Swashbuckler’s Shirt with a white face-mask like the White Bandit Mask. The Studded armor can be bought from several different vendors, and is great everyday wear, as well. And, for all of those who want to take the easiest route possible: eat Savory Deviate Delights until you transform into a ninja! Kirina under the “Flip Out” ninja affect of the Savory Deviate Delights. 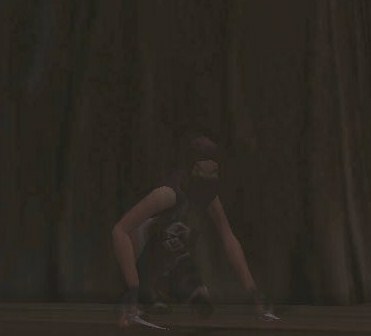 Depending on the gender of your character, you will always be either a Human male or female ninja.